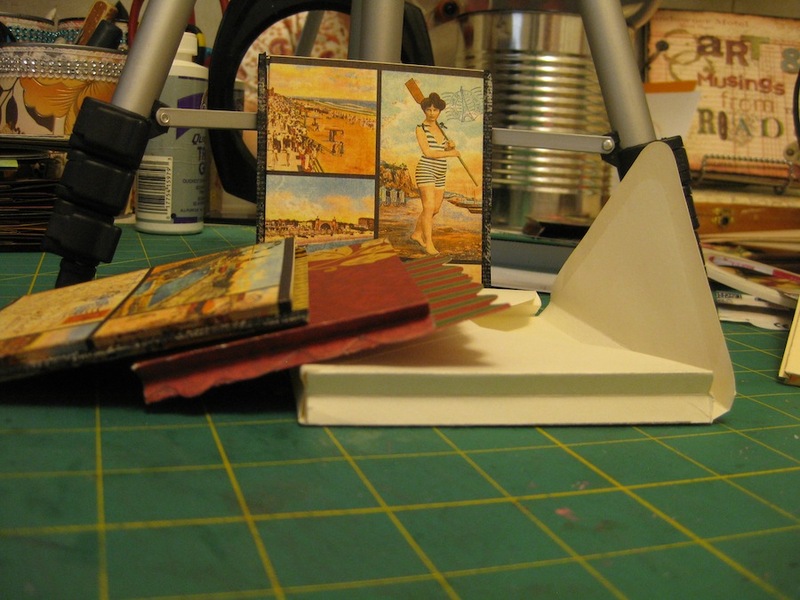 Measured Layers on mini album tags. 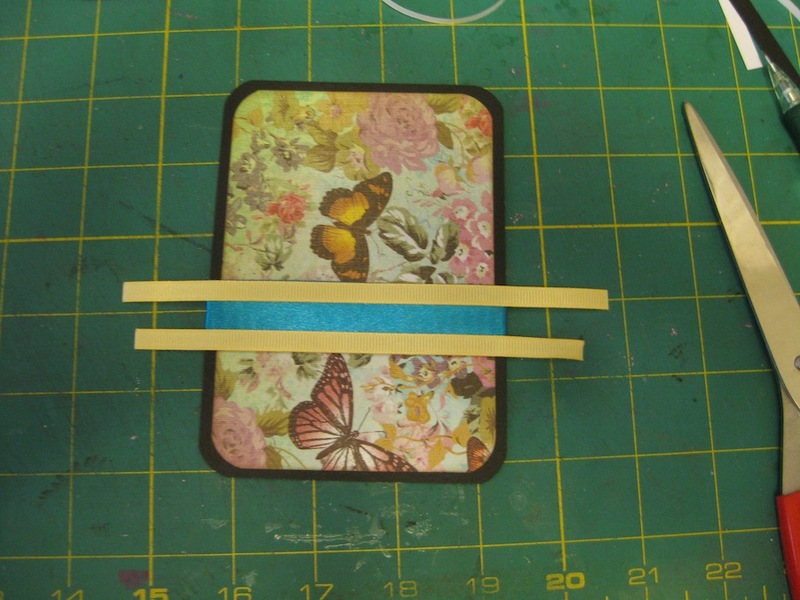 For my continued series on how to make tags for my granddaughter’s mini album, I offer you this tutorial on how to make Measured Layers on the tags. One thing that was not included in this tutorial is how to hide ribbon ends on the tags so they don’t show. Wrap the ribbon around the layered feature piece before adhering it to the tag. The two white strips on the ribbon, below, will hold two additional pieces of ribbon in place. 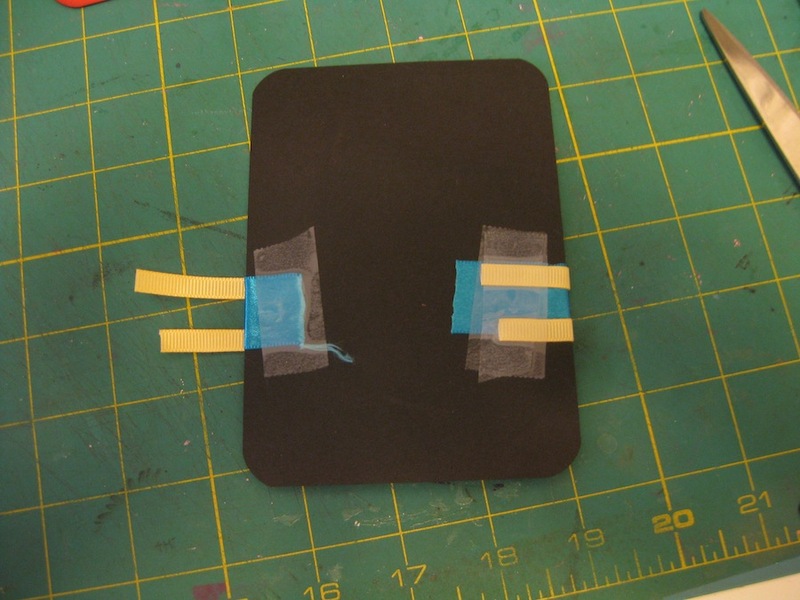 Using regular packaging tape, or Scotch Tape, secure the ribbon tails to the back of the black card stock. Add any other ribbon or lace you wish to over the ribbon on the front. Then secure these tails to the back of the card stock as well with packaging tape. The ribbon on the front of this piece will act as a pocket for anything you may wish to have inserted. A photo or a journal tag. 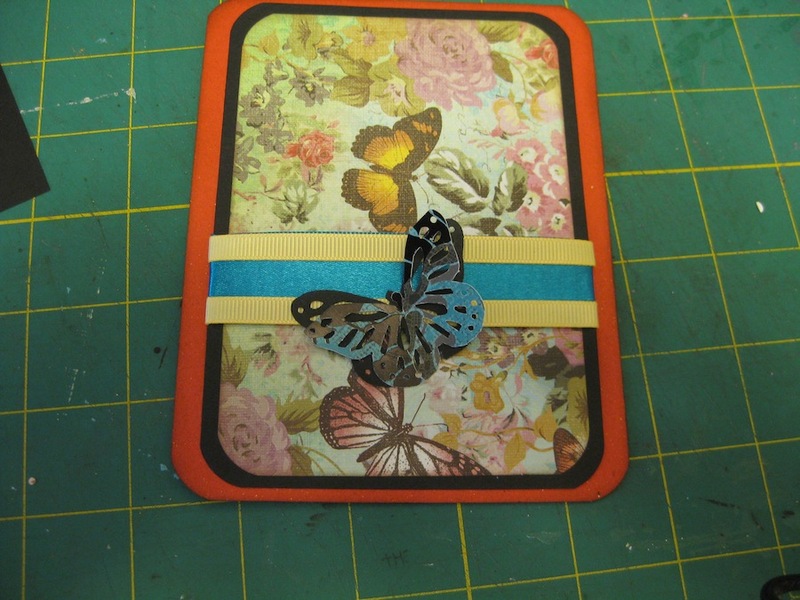 I’ve used a Martha Stewart Butterfly Punch, one from patterned paper and one from black card stock to act as a shadow, and attached the bottom of the body and the left bottom wing to act as the tag holder for the insert. I have created a tutorial video on making the front and back of one of the tags. 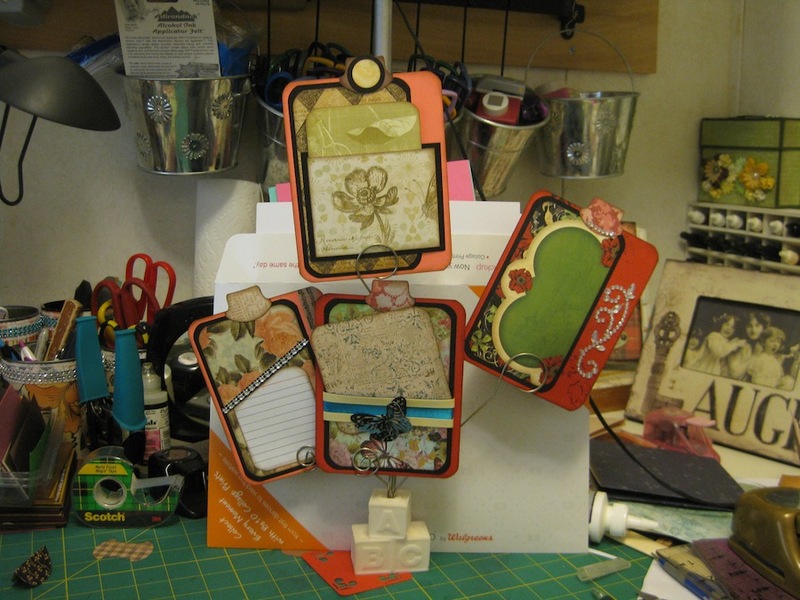 Your imagination and supplies are all that is needed to create your own Measured Layered tags. I hope you enjoy this lesson in getting dramatic effects in your tag making. One apple didn’t fall far from the tree. Our youngest daughter and her little family have moved from Arizona to California for her husband’s work. Both of them have moved far from family and friends and have lost their long standing friendships and relations because of the move. It had been difficult to hear the sadness and longing in her voice as I talked with her on the phone. I wanted to help but had no idea what to do…and I live a long way away from her and can’t be there for a hug and a cup of coffee while watching her adorable twins. The next best thing I could think of was to get her thinking about making something for her new apartment. Adding her creative touch to that new space to make the place her home. You might have an idea how excited I was to hear the laughter and fun return in later conversations. She told me of her plans to use stretched canvas over wooden frames on her dining room wall. 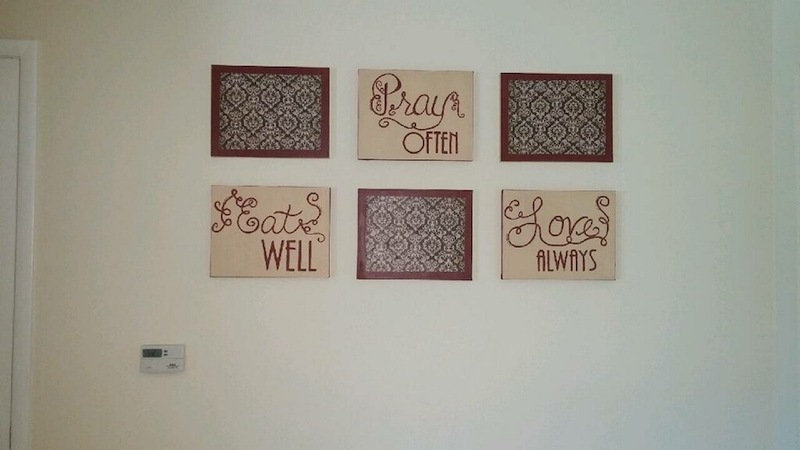 The wall decor is complete and I am so very proud of our daughter. I hope you enjoy her creativity. This is her take on “Eat,Pray, Love” and I think it is FABULOUS! 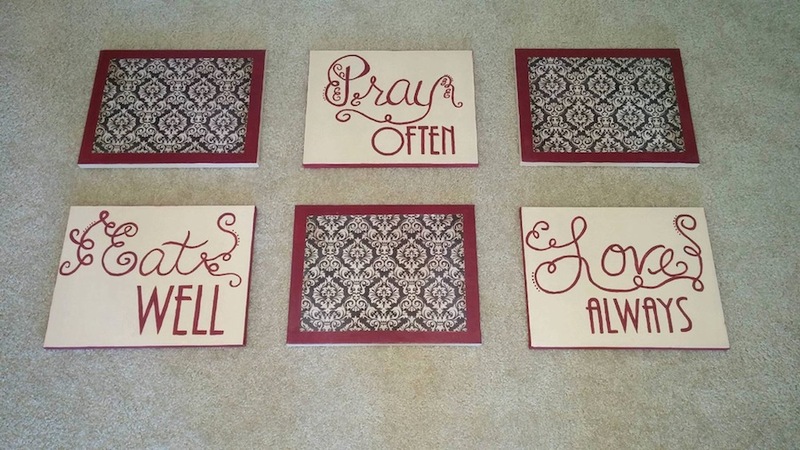 Our daughter made these home decor items when the twins napped or were put to bed for the night. She needed some time to decompress from her little “Adrenaline Junkie” in the making. 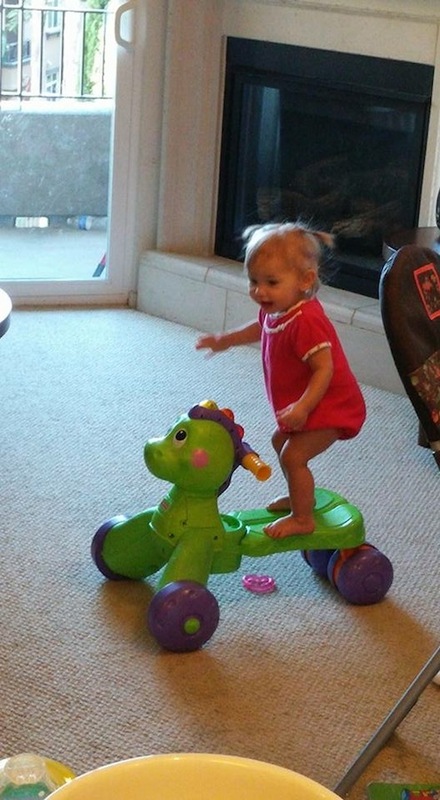 That little one seems to have no fear! 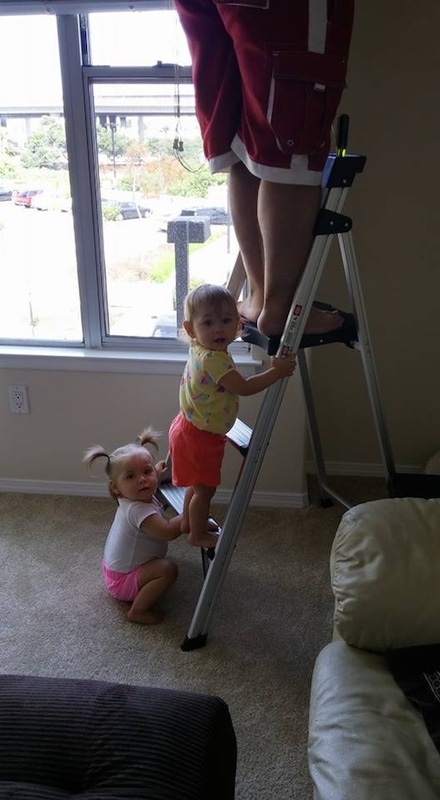 She is even eager to help Daddy with hanging the curtains in their new home while sister steadies the ladder. These two treasures give me a joyous heart. 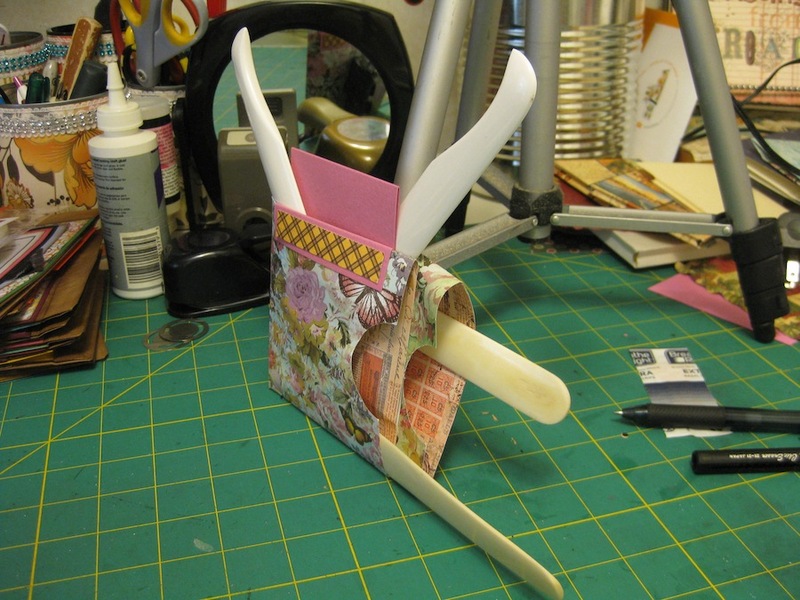 If a beginning crafter does an Internet search for “How to make mini album pockets” or “How to make mini album tags” most of the time the results are completed mini albums with the creator showing what the finished project looks like. If a beginning crafter searches YouTube with the same queries the results are a video ranging in length from 5 minutes to over 25 minutes showing a completed project with the creator telling me “Here is the pocket I made” and “Here is the tag I made”. 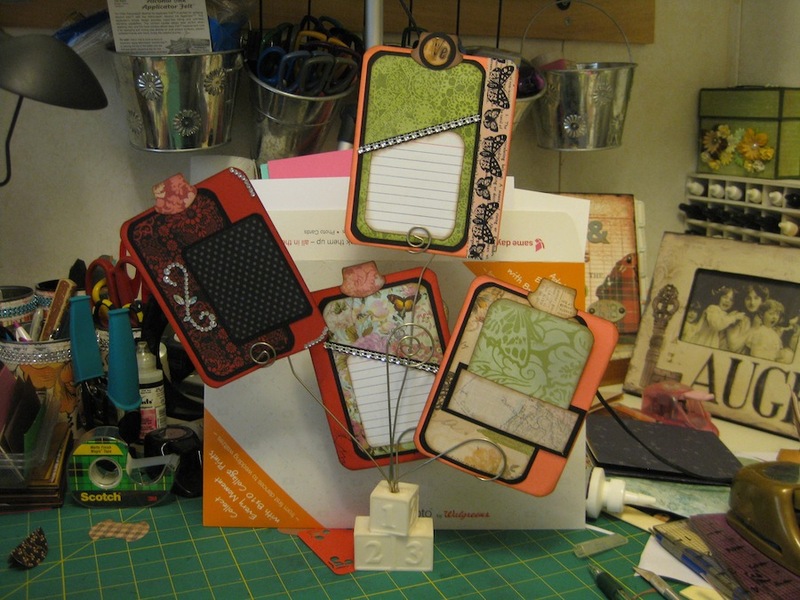 When I started making scrapbook layouts and then ventured into mini albums I was continually frustrated with finding there was not one single video, or blog post, that showed the process of making a pocket or a tag. I have taken it upon myself to be the one that shows all the steps necessary to create these things. At the bottom of this post I will include my YouTube videos that show how to make pockets and tag inserts. The tags, just in case you are wondering, are elements to the mini album that can be pulled out from the place they reside. Photos and journaling are added to the tags to tell a story…the story that is being told through the photos. A trip to DisneyWorld, or DisneyLand. High school prom or graduation. A wedding or engagement. Pregnancy or the birth of a new baby. Next week I will be making tags for a mini album that seem to have “Advanced” skills required but they are things a beginning crafter can make easily. I am trying to take the mystery out of being creative when it comes to designing a mini album to enjoy yourself or as a gift for someone else. When is it good to be an Enabler? This is not the typical meaning of the word “Enabler”. One that congers up feelings of dread and fear. Although I do have to admit that I did have some feelings of dread and fear at times. Power tools are not my thing. The roar of a turning saw blade, the scream of the wood as it is being torn apart. Ooooh, that sounds Creepy! I do like the smell of sawdust as the wood is being cut, though. For well over 12 years, no matter how much I b**ch, complain, and threaten…my husband brings his tools into the house. Table saw, drill press, skill saws, lumber, drills, and all other manner of hand and power tools. Why? Because he has too much cr…., er, uhm, stuff to go in the small shed we have. He has over grossed the small shed with his other cra……stuff. He had been looking for a larger shed over the years but there just wasn’t anything he found to be large enough to store his tools plus be a good size as a work room. He finally found one in February or March of this year. Spring brought many weather problems. Tornadoes, rain, hail, and high winds. The ground had to dry out before the new shed would be delivered. Keep it from sinking into the mud. The shed arrived in mid August. 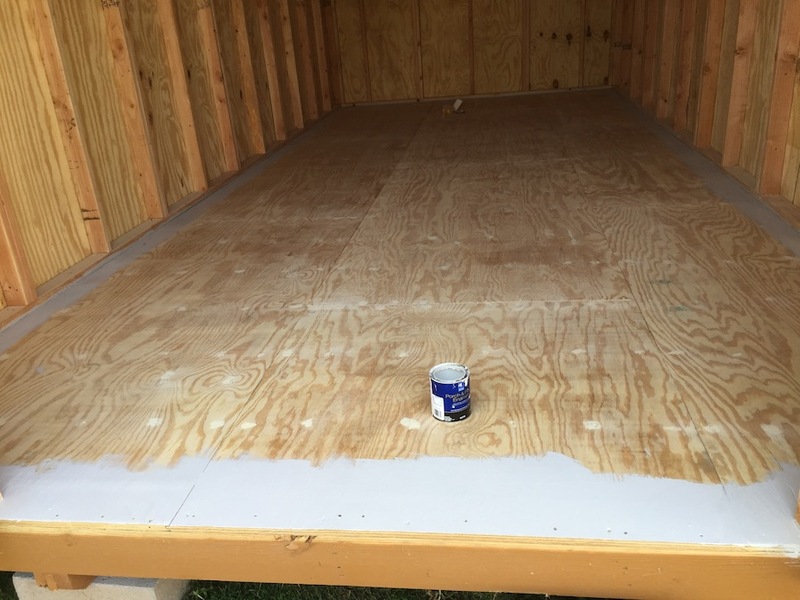 While Joe was out of town he requested that I paint the floor of the shed. I had to get out in the early hours of the morning before it got way too hot. While Joe was home we used some kind of Spackle stuff to fill the screw and nail holes on the floor. Once that was dry and sanded then I was able to paint the floor. It only took about three hours to get the floor painted. And the paint I used…floor and deck paint….dried in a couple of hours. I would need to put another coat on the floor, and I did do that several days later. 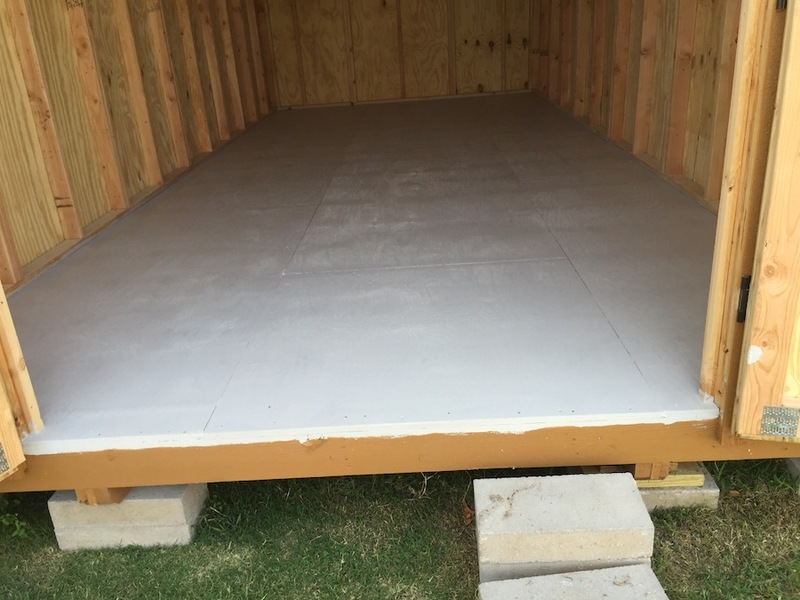 Last week, while Joe was home, he was really excited about getting started on his shed. First to be built would be a platform to cut the plywood sheet that would finally become a ramp to move his heavy tools in and out the door. He called his contraption a “Sacrificial Base” to cut plywood over some plastic sawhorses. So, for five days I helped him get his Sacrificial Base made, steps to replace the concrete blocks at the shed’s door, and the ramp. During that time I got to use both of my cameras to video his work. There were even some really cool shots from underneath the plywood as he cut his way through. If you would like to watch the two videos I made showcasing my husband’s creativity you can watch them both below. In this Friday episode for my YouTube channel I show you what it is like when I create. Interruptions, changing my mind on photo placement, hating one element that I permanently glued down and know that taking it off would be disaster. Getting an idea that seems, at first bloom, to be the best idea I ever had in my life then find out it was not such a good idea at all. 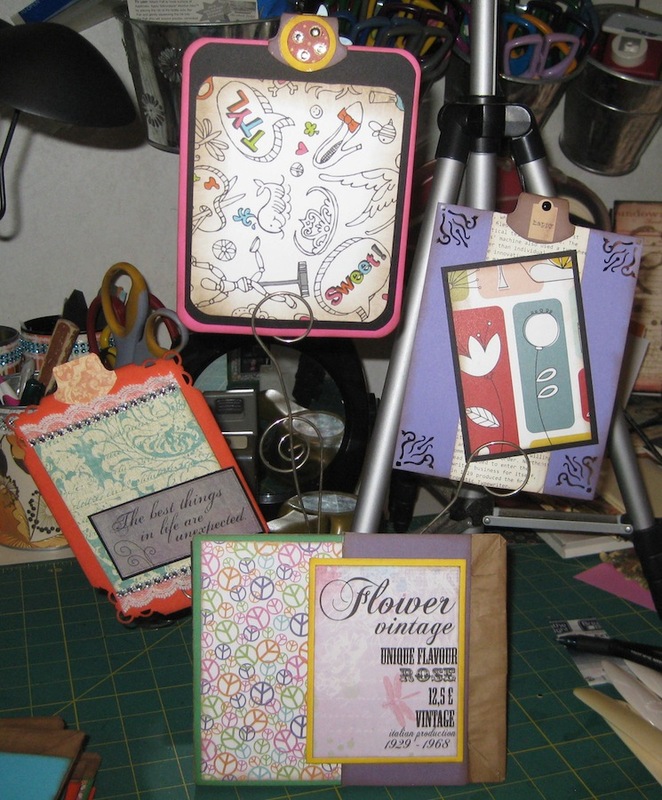 When I first started making scrapbook layouts I binge watched YouTube videos on how to do it. It looked so easy! Being a “semi” perfectionist I would beat myself up and get really frustrated with the results before me. Why couldn’t I get things to look like I saw in the videos?! What was wrong with me? I almost gave up because most of the people I watched on YouTube had a college background in graphic arts or art theory. I never went to college. I told myself that I was a total loser and would never figure this out. I may not have a college education but I make up for that by sheer persistence and always searching for answers. At the present time, I am trying to become “friends” with lace. I thought a top border of pretty lace would be a really good touch on the layout for my twin granddaughters. 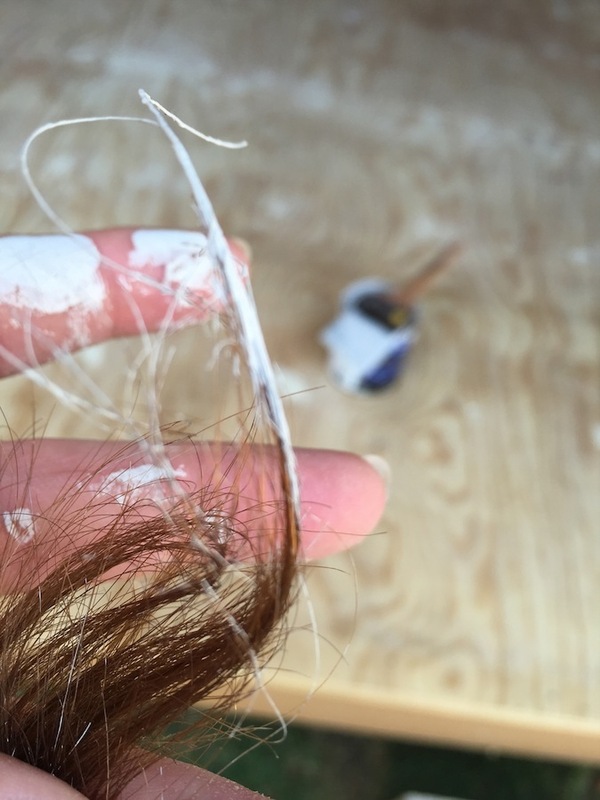 As soon as I glued it all on I regretted that decision. It was too late by that time. The paper would roll backwards from the application of the wet glue if I took the lace off. 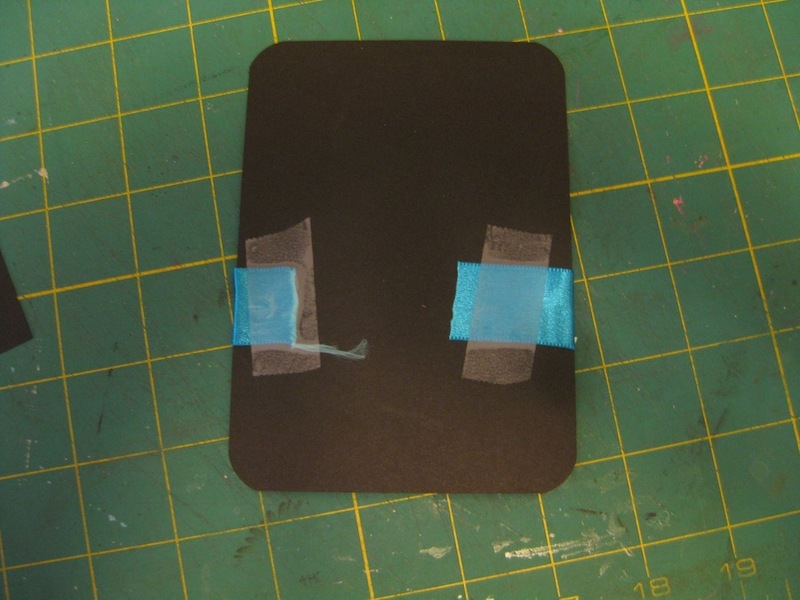 Also, some of the areas where the glue had a thin application would be dry and the paper would tear. So each time I looked at that flaming “Fabulous” idea I would cringe. Application of lace. Hate it. Just move on….pretend like nothing is wrong. I knew the title of my two page layout would be “Mischief”. I knew where I wanted it to go. I used my Original Sizzix Machine and thin alpha dies to create the title. That turned out good. Just get it adjusted before I glue the letters down permanently. 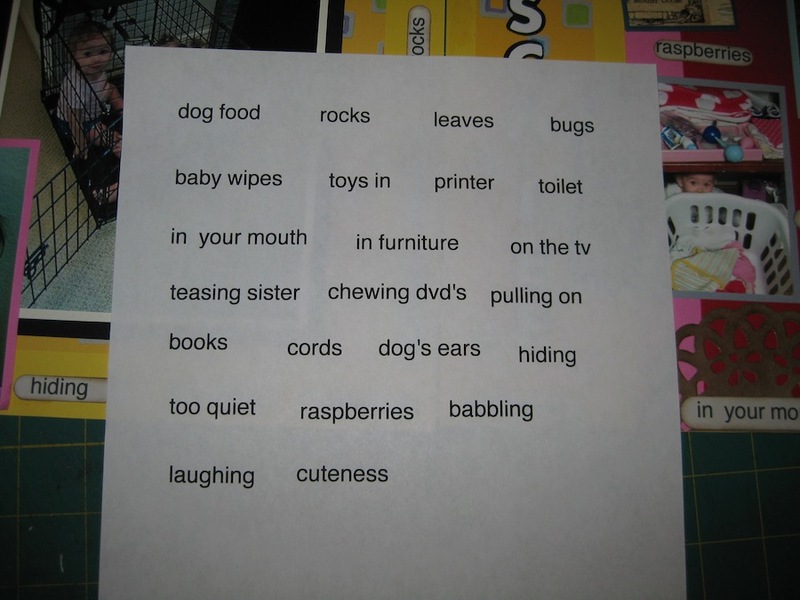 My “brilliant” idea was to create word bubbles for the mischief the girls got into. I have an old desk top publishing software that I used for this idea. I printed this out on regular printer paper to see the size and test on my Stampin’ Up! Word Window Punch. When I saw this working on the printer paper I put a piece of card stock in my printer to be used on the layouts. I had also fixed my problem with the bad lace at the top of the layout. So now I have lace festooned turkeys. I then moved the word bubbles to the outer edges of the pages. Crowding the title distracting it from the impact I was going for. Take the word bubbles off and place them around the outer edges of the layouts in a better pattern. Giving each page the balanced weight they deserved. I just placed the words where they would fit and wasn’t paying much attention to how they would read. Oh well, my daughter will have a good laugh as she thinks about the girls “hiding in toilet” that can be read at the bottom right of the left page. You can click on the above photo, or the one below, to see the “hiding in toilet” bit. For the newcomers to creating scrapbook layouts I say to you….keep going. Don’t stop just because you don’t think you are talented enough to do this art form. If you want to watch the video I made showing the reality of creating scrapbook layouts I have added it below. 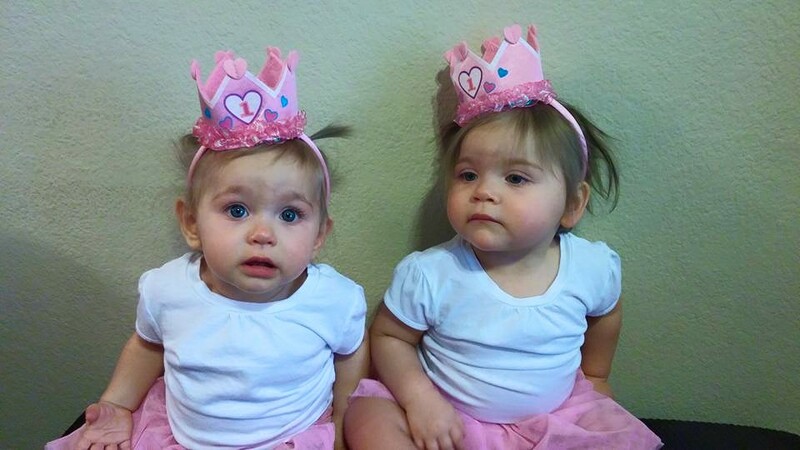 My twin granddaughters turned one in June, 2015. They are so cute. When my daughter was pregnant with them she would tell me, during phone conversations, how much she was looking forward to them being born. She was so excited to be a Mom. She read books about child birth and child rearing. She read everything she could get her hands on preparing to become the best mother she could be. When these precious girls were just a couple days old I told Carissa, “Now it will be milestones”. She looked at me like I had started speaking in an unfamiliar language. You will, I told her, think you had passed out from total sleep deprivation and didn’t hear their cries the first night they sleep more than two hours between feedings. Fear will grip your heart and panic will set in. NORMAL. The next milestone will be when the babies try to hold a hand still before their eyes so they can see this marvel of human construction. They will, often, hit and punch themselves as they inspect this odd thing. The next milestone will be when the babies learn how to hold their heavy little heads up while on their tummies. The weight of their heads on the weak neck muscles will cause them to bang their little noses and faces on your shoulder bones, the floor, or whatever surface they are laying on. The next milestone will be when they roll over on their own. I told her “You will be giddy with excitement when you see this for the first time”. This, I told her, is the harbinger of doom to you as a Mother. Carissa whipped her head around and looked at me as if I had suddenly become some kind of demon. “Why do you say that? !” she asked in a voice tinged with anger. The next milestone will be when they begin to pull themselves up to a standing position using furniture to steady them. Oh boy. Being higher off the ground will mean they have access to everything within their reach. Exploration of their world really begins. Your vocabulary will change a little bit. It will become “No, no, NO!” instead of just the single “NO!”. I then told Carissa what she needed to pay attention to was “Total Silence”. That will NOT be good. She laughed at me. She actually had a belly laugh at that. Hmmm, we’ll see. 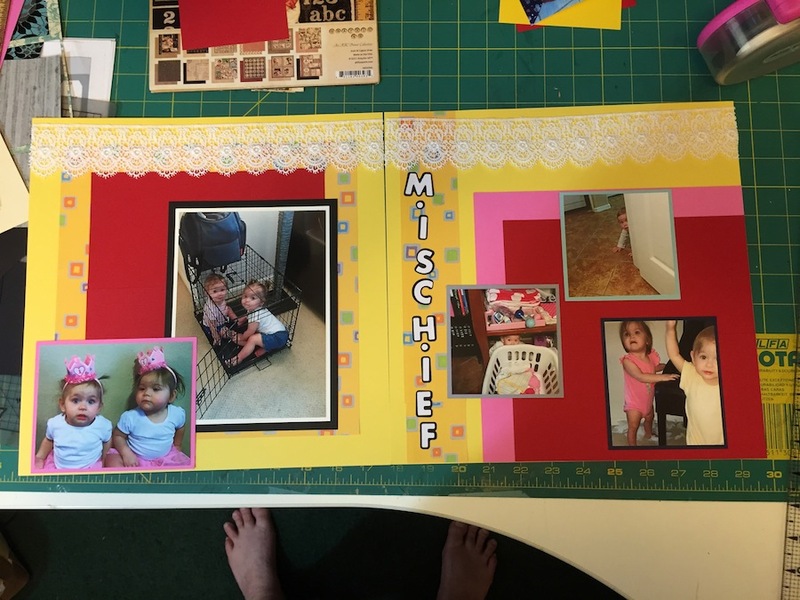 So, at this time I am creating a scrapbook layout titled “Mischief”. 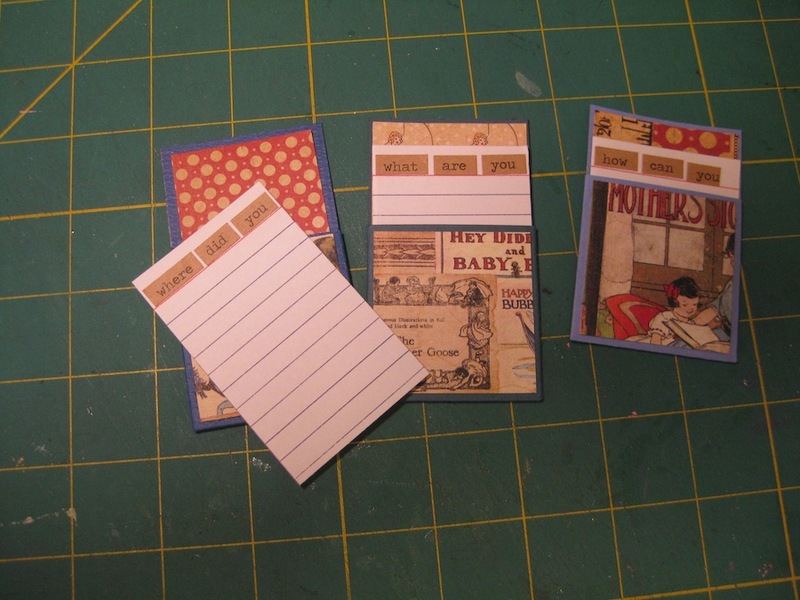 I have a video showing you how to make Library Card Pocket tags. This is so easy to do. You don’t need a template. You don’t need to download a PDF to cut out a template. You don’t need specialty tools. You only need a pencil, ruler, scissors, adhesive, and paper. 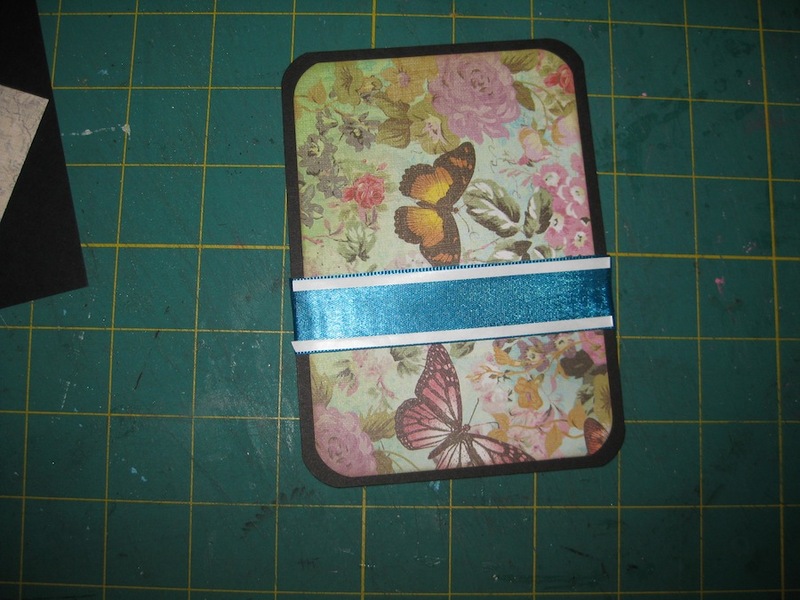 So here is the tutorial on making the Library Card Pocket tag and the tag insert for journaling. 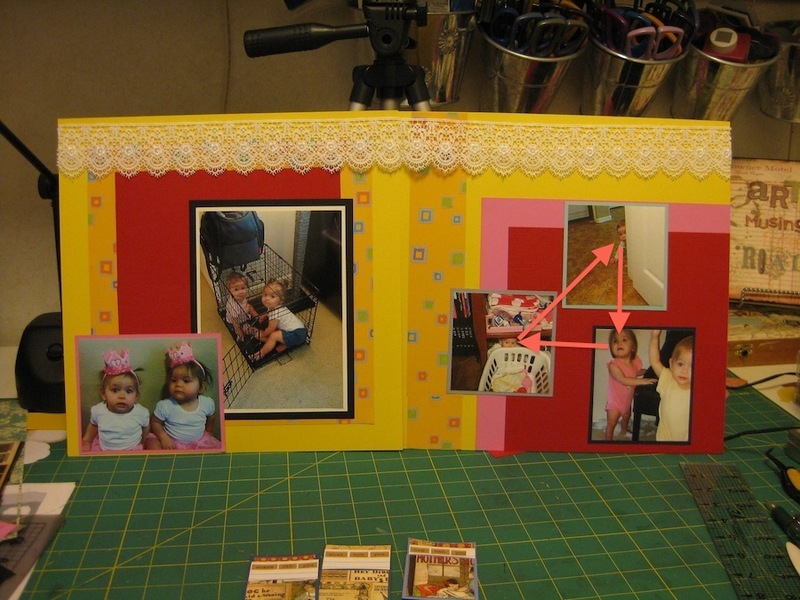 The Rule of Thirds in a scrapbook layout. The Rule of Thirds is a guide used by professional photographers. Taking a static image (the photograph) and make it come alive. Create the illusion of depth, width, height, motion, and drama. During my truck driving days I tried to figure out this Rule of Thirds concept to make my photos more interesting. Make my, mostly, boring job interesting to someone that did not travel as I did. Here are three examples of how the Rule of Thirds works in photography. 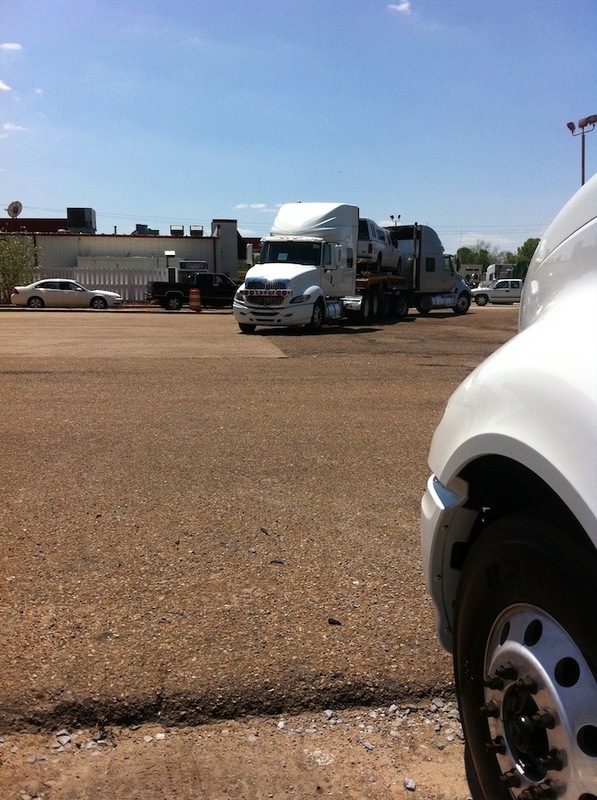 First – Distance and Motion: This photo was taken in Mobile, Alabama at a parking lot where the trucks were stored and ready to be transported elsewhere. How does one make a parking lot interesting? It is just pavement and totally boring. 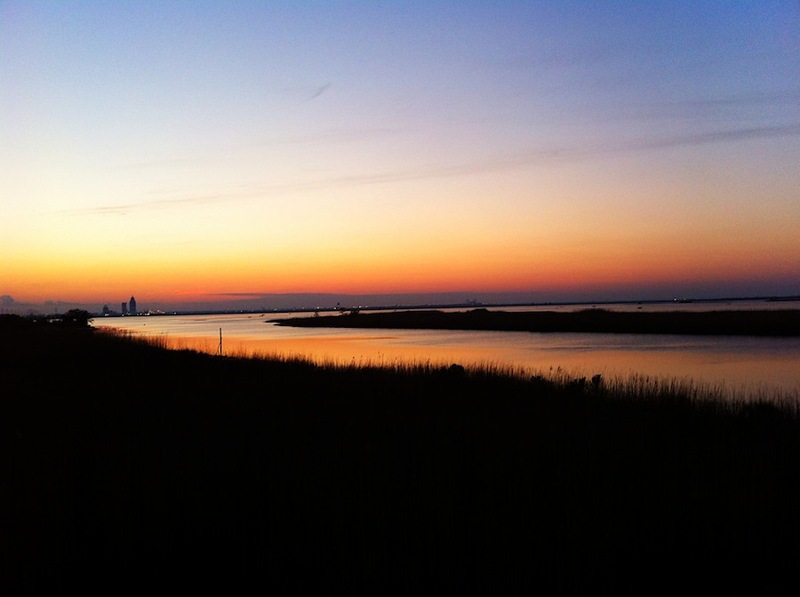 Second – Emotion and Grandeur: This photo was taken on the Causeway in Mobile, Alabama. The setting sun over the waters of the winding Causeway, twinkling lights of the city in the far left background, shadows of the night in the foreground. 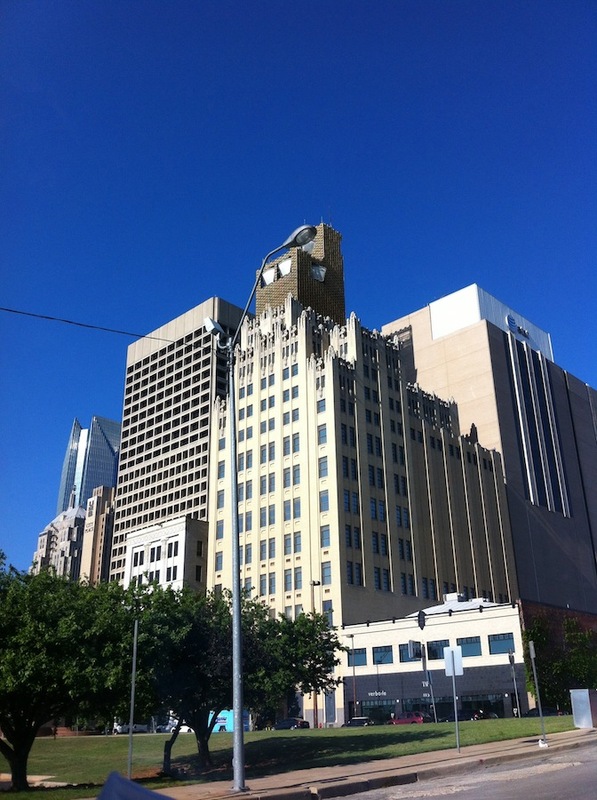 Third – Height and Drama: This photo is of the old buildings of downtown Mobile, Alabama. The architecture of these buildings are interesting because of the numerous lines and angles. The differences between old and new. 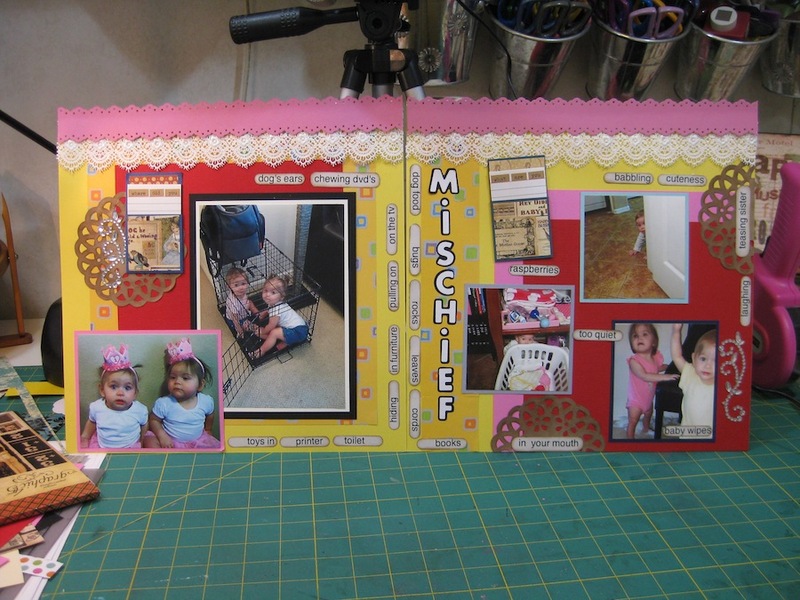 These principles of the Rule of Thirds in scrapbooking can be achieved by photo placement. The layout I am creating of my twin granddaughters is tentatively named “Mischief”. 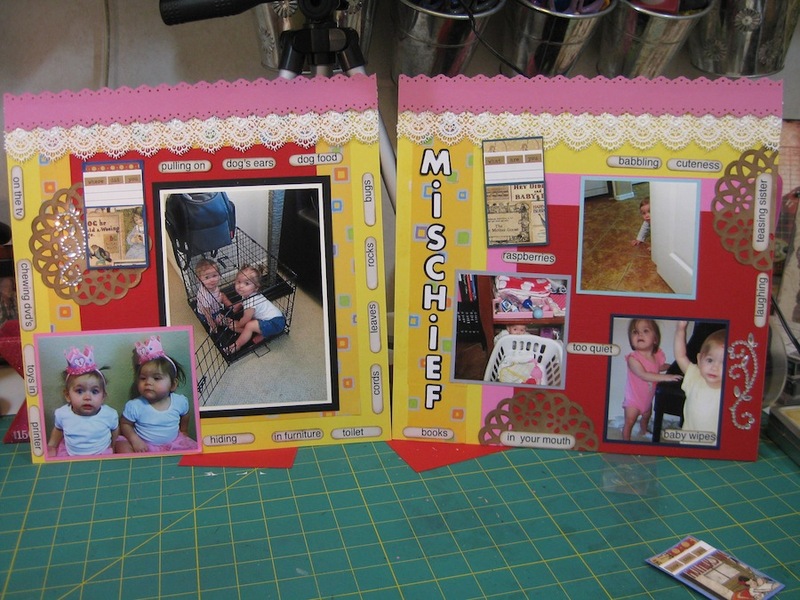 It is common for anyone starting out making scrapbook layouts to put their photos right, smack dab, in the center. I have used the Rule of Thirds on the right layout to create a “Triangle” of my granddaughter’s faces. This was on purpose. It was to cause “Flow”. You look from one image to the next so you don’t miss anything. 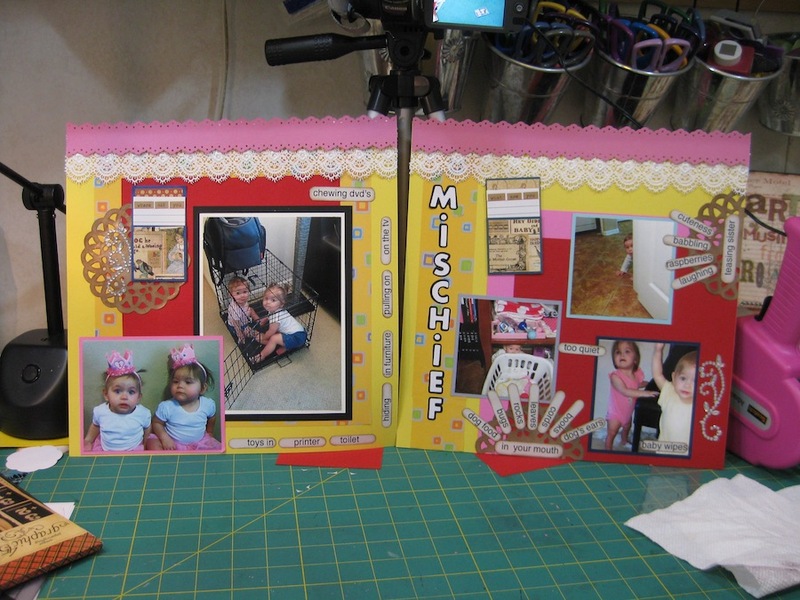 To see how I achieved the placement of these photos for the layout, I have created a video showing how to use a guide, or a template, to achieve “Flow” in your multi photo scrapbook pages.